After the Chicken Ranch and Colonial Street, you turn the corner to discover a small part of the massive sets for Ron Howard's "How the Grinch Stole Christmas" shot in 2000. The sets featured here were originally built on the flat area next to the Psycho house now occupied by the War of the Worlds set. 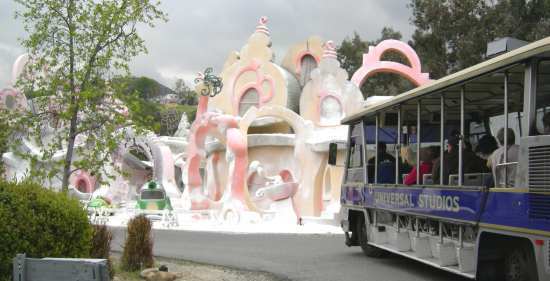 The three Whoville buildings were part of the "Santa Drop" sequence. The rest of the sets were constructed entirely on soundstages (e.g. Stage 12 contained the town set). The production used 10 soundstages in total, and remains one of the most space-intensive productions ever shot at Universal. 1,938 Candy Canes were used in the decoration of the Whoville sets and enough fake paper snow was used to cover nine football pitches. The sets are regularly repainted, as they were never originally designed to be outdoors beyond the shooting schedule.